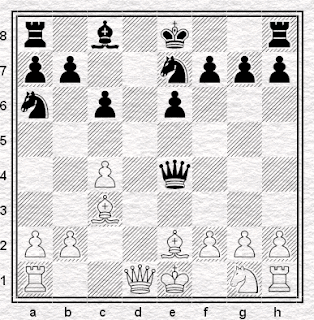 The Streatham & Brixton Chess Blog: A Marshall Gambit refutation? My favourite online chess resource is ChessPublishing, Tony Kosten's opening-theory site with regular monthly updates covering the entire spectrum of chess openings, and updated ebooks containing and summarising the section authors' previous work. It's far from perfect, and some sections are more useful than others, but I like it. 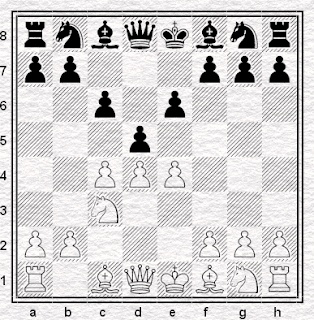 I subscribe to the section on 1.e4 e5, the one on 1.d4 d5, and the one on Flank Openings - which may not seem entirely consistent but I take a different view of classical openings when I'm on the White side of the board. The 1.d4 d5 section is written by Ruslan Scherbakov: I have a lot of time for Scherbakov, who seems to put a lot of work in when considering and evaluating both the openings and new games which develop the theory. All right, that sounds like a blurb from a mediocre openings book, but trust me. If I didn't think it was good I wouldn't pay to read it. To my mind Scherbakov not only puts the work in, but gives us the benefit of his own study in having relied on, and therefore studied, certain lines during his own professional career. So, for instance, there is a surprisingly long section - which, I'm afraid, you can't read unless you're a subscriber - on the Marshall Gambit, which he has defended, from the Black side, for a number of years. Given the absence of any specialist books on the opening, I imagine this is the most substantial contemporary source for Marshall Gambit theory, in English anyway. 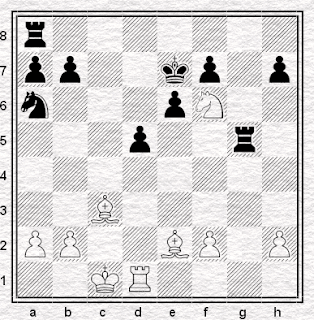 I'm not referring to the famous line in the Spanish, but White's gambit response to a Black triangle pawn formation. 1.d5 d5 2.d4 e6 3.Nc3 c6 and now, rather than play 4.e3 or 4.Nf3, White can try 4.e4. 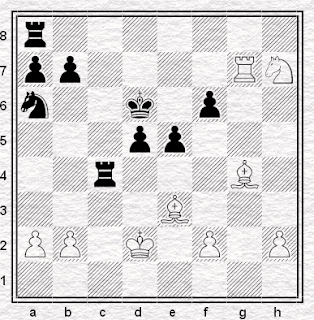 Black plays this way in order to avoid the Exchange Variation of the Slav, on the one hand, and on the other, the necessity to learn a second opening, the Nimzo-Indian, which arises if Black begins instead with 1.d4 Nf6 2.c4 e6 and then White plays 3.Nc3 - making the desired Semi-Slav unlikely. Mind you, Sadler (Queen's Gambit Declined, Everyman, 2000) warns "do you want to spend a lifetime learning the 4.e4 Marshall Gambit?" indicating that not a lot of work will necessarily be saved by making this choice. Still, in The Complete Semi-Slav (Batsford, 1994) Peter Wells says that "personally, I enjoy playing both sides of this fascinating gambit" and it was recommended, for instance, in Larry Kaufman's well-received repertoire book The Chess Openings In Black And White (Random House, 2004). It's one of those openings that you feel you'd like to avoid when playing on the other side, but seem somehow not quite entirely trustworthy as a part of one's own repertoire: Kaufman considers his opening recommendations to be "fully respectable among strong grandmasters" but it certainly doesn't seem to crop up very much above 2650 level. Never mind, that's a higher rating than any opponent I've ever played (or so I believe - what was Tony Miles' rating when I played him in Wolverhampton about twenty years ago?) but even so, I do get the feeling, as with the Benko Gambit or the Chigorin, that one day somebody, or something, is going to find a clear-cut refutation. Lautier-Gurevich now continued 10.Bxg7 Rg8 11.Bf6 and now 11...Qf4, which used to be thought good, was burned up after 12.Bc3! 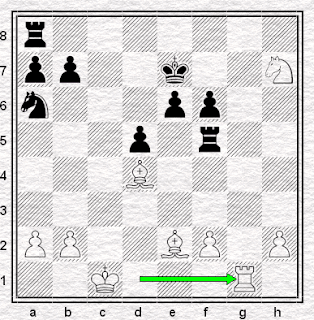 Rxg2 13.Nf3 f6 14.Qd2! 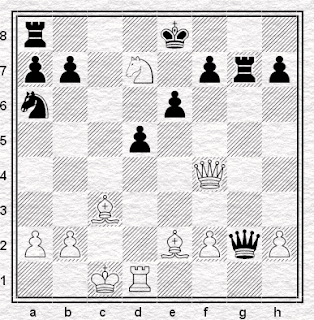 when the exchange benefitted White as the queen's absence made it hard for Black to defend his many weaknesses. "Black's position is quite acceptable..."
"...since after 22.Nxh7 Rf5 23.Bd4 f6..."
"...White should be careful about his knight." As I say, I like Scherbakov's work, but in this instance I wonder how far he's gone to check his conclusion: if there was an Informator symbol for "Jimmy Hill" I'd insert one here. I don't believe it and neither does Rybka, which likes 24.Rg1! and likes it a lot. and the best I can produce on Black's behalf is "fighting for a draw". Those bishops are really pretty good. That's not a forced line but I've been unable to find any deviations which help the Black cause - Black can take a queenside pawn, or play an early ...Rc8+, or try ...Rh8 attempting to tie up the White pieces a little, but in every case it looks like Black's position is under too much pressure to be held. Now it's true that this is Rybka-led analysis and that computers aren't always the best judges of positions in the Marshall - as you'll see if you use one to play through the earlier moves and watch the evaluation swing about. But still: in the absence of any contradictory evidence the position after 23...f6 (though not the Gambit as such, of course) looks like a busted line to me. And I do wonder - given that the computer comes up with 24.Rg1+ immediately, was the original conclusion, that "Black's position is quite acceptable", put to any real test?